Give Love On Christmas Day! Sunday school teachers James Nelson Bote and Jim Rhodel Amigo packing the goods together with some of their students. Christmas is the most famous Christian celebration. It is when we celebrate the birth of our Lord and Saviour Jesus Christ. We celebrate it in various ways and one of the most common thing we do is singing Christmas carols as our way of proclaiming God’s love. 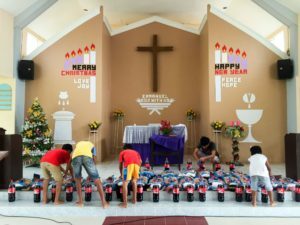 And as we celebrate this year’s Christmas, the Christ Lutheran Church in Mahayag, Albuera, Leyte conducted a simple activity in which they can preach God’s love and also help our less fortunate brothers and sisters. 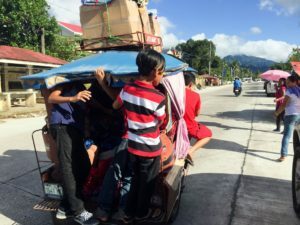 The activity started with a selective house to house carolling approved by the barangay captain from December 10 to 23.The raised money then was used to buy goods (Noche Buena items to be specific) and was packed. The church secured a list of 25 poor families and individuals within the community and scheduled a date for distribution which is on the 24th day of December right after the divine service. The church now sang Christmas carols, but this time they are the once who are giving. Sunday school kids delivering the goods. None of these poor families and individuals knew about this activity and it’s the church’s idea to surprise them. As they sing, the families came out to supposedly give money, and some of them even asked for apology as they say they’ve got nothing. It is very humbling watching the families, and their reactions are priceless after the church revealed that they’ve got something for them. One of them even said that it’s the first time of his life that someone brought him a gift and he can’t believe it, he said he felt like he’s on TV. Everybody was filled with awe and just can’t imagine that a simple act like this would produce a burst of emotions and give joy to everyone. 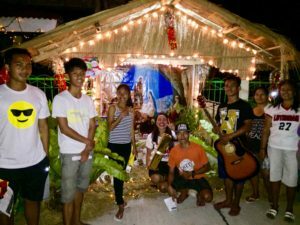 This activity was started by the CLC Youth Mahayag on December 2015 and now became a yearly church activity. It was all inspired by the fact that as Christians, we can’t just celebrate and party while some of our brothers and sisters suffers in scarcity. And so the youth came up with the idea and are still planning things to add up to this and are hoping that other churches would do the same. There are lots of ways to celebrate Christmas. We have different ideas and different ways of understanding it. But one thing is for sure, it’s all about the love of Jesus Christ!